The four star Parador of Albacete is situated on the outskirts of the town and has many open-air activities nearby. The garden and seasonal swimming pool are perfect for an afternoon stroll or to have a refreshing dip on warm summer evenings. One of the features of this country house is an attractive indoor corridor which characterizes elegant simplicity. Great emphasis has been placed on the large windows providing natural light and immaculate wood which together result in an attractive and comfortable ambiance. The gazpacho soup on a hot summers day could be followed by a Mancha salad, composed of codfish and cheese. The Fiesta at Albacete is held in the month of September and is well worth a visit. In addition, the celebration of the feast of San Juan takes place in June and the Theatre, Music and Dance Festival is usually held in August. Albacete has a cathedral and archaeological Museum and the attractive village of Chinchilla del Monte is approximately 4 kms away. In the Alcacaz mountains you may find excursions available during certain months. Other outdoor activities include hunting, horse riding, bicycles, kayaking and a 9 hole golf course. The Albacete Parador has sixty two twin bedded rooms, two single and four double bedrooms. There is a telephone, television, satellite television, TV canal plus and mini bar in every room. There is also heating, air conditioning, elevator, currency exchange, a restaurant and bar, 2 conference or banqueting rooms, a gift shop and free wireless internet. The Parador Albacete has a swimming pool, tennis court, 9 holes pitch and put course and car park (without security and limited places). Distance from the nearest airport is approximately 10 kms, train station is 4 kms away. This are our very least enjoyed Parador on our trip. I am sure it didn't help that it was raining but the place was very damp and dreary. The town was equally unexciting. The only other couple in the dining room sent their food back however our dinner was good. We would definitely skip this one in the future. We were disappointed in this hotel - noisy (almost beside the motorway), uninteresting countryside, miles out of Albacete, very average room, food pricey. We won't be going there again (this is an exception - we would be happy to recommend all the other paradors we've visited). This was the fourth parador we stayed at from 5 over 6 days. Overall it was the 'least best' of the five. No major problems, just some niggles. Disabled access is excellent, for the entrance, but the room we had was a good 150 metres from the main entrance. We had a wheelchair, but you need to be aware of this. The room itself was excellent, the period furniture was classy, and the bathroom clean and one of the best we had come across for disabled, more like a wetroom. The bar was OK; there was a large TV which dominated the room. The barmaid was the exception to all the staff as far as English speaking went, but at least I was able to practice my limited Spanish! The reception and restaurants' staff spoke excellent English. The restaurant was quiet, but the food and service were good. The English version had rather dodgy translation; a problem with all Paradors in my limited experience. I suspect even if your Spanish is good, restaurant menus can be a problem. The breakfast was up to the usual standard. Lovely and quiet by the way. Worth bearing in mind there are very few paradors in this area, and even fewer recommended for disabled. 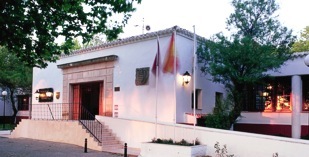 A manor house on the plains of La Mancha now a hotel in the Parador group.